Spring 2015 Design Studio final presentations. 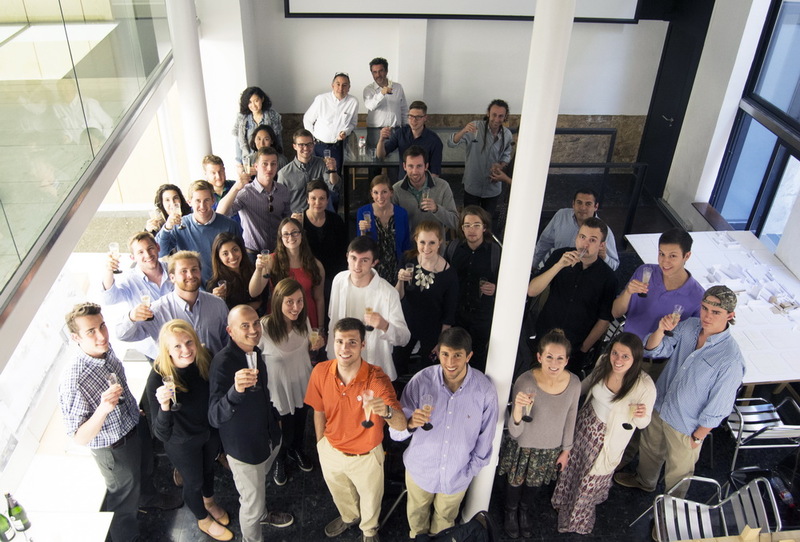 This was how our Clemson University and Texas A&M University students have finished their Spring 2015 semester in Barcelona. We hope that you are all enjoying being back home and that we will see you back in Barcelona soon. 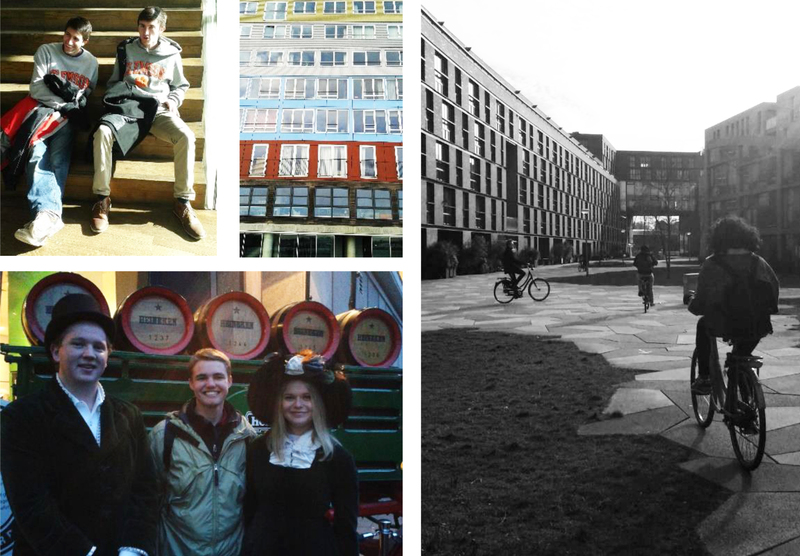 Check out the video made by our Spring15 Clemson University students about their study trip in Netherlands. Beginning on February 2 and continuing each Monday throughout Febraury, visitors will be introduced to the work of a contemporary thinker. The works feature Karl Marx (2/2), Walter Benjamin (2/9), Maurice Merleau-Ponty (2/16), and Maurice Blanchot (2/23). The work will be described through a reinterpretation of the concepts described by each thinker to help to understand their value to contemporary views. The topics focus on an evolution of social-cultural ideals that are intended to stimulate the thought processes of the participants and provide an alternate perspective of the cultural environment of the day. This exhibition is conceived from a selection of notebook drawings. These various drawn texts and written drawings are dramatized via a delicate artificiality. They are supported and attached to the wall by magnets, in particular positions of balance. This way they distance themselves from the wall and are treated as objects of specific and diferent weights. Opening on the 10th of February is the 1 day 1 photo exhibit at Arts Santa Monica. 31 photographers took one photo on the same day of each month of the year. A Catalan proj­ect, but employing some non-Catalan photographers, the exhibit will surely capture the spirit of the people of Cataluña despite the diversity of its contributors. In January the city of Pilsen in the Czech Republic launched its program as the European Capital of Culture for 2015. The event featured a grand performance of light, music and Ḁlm as the yearlong festival kicked oἀ. The feature event was held in the new Pilsen theater. The concert also included public contributions as those at the festival used plastic tubes to play along with Beethoven’s Ode to Joy performed by the orchestra. The exhibition will oἀer a variety of cultural shows and performances along with a festival entitled “9 Weeks of Baroque” that will focus on multiple genres from the Baroque Era. For the 2015 year, Pilsen is sharing the honor of being the European capital of Culture with Mons in Belgium. If you’re visiting Paris and planning on cramming in as many museums and monuments as possible, the Paris Museum Pass is a good way to save both money and time. The pass o°ers direct access to 60 of Paris’s most iconic sights, and allows you to skip past the long ticket queues. Whether you plan to visit the iconic Louvre, Musée d’Orsay and Pompidou Centre, or to take your time exploring the city’s sites, there’s an option for everyone. A new exhibit in London challenges the way war can be portrayed, and the way in which we engage with photo-graphs so that we actually see the inconceivable. Photos and artifacts from all over the world come together in this exhibit to make the viewer feel both heart broken and awe-inspired, according to critics. A major exhibition of the Turner Prize winner Richard Deacon, a leading British sculptor, best known for his large, lyrical open forms. Deacon is known for his large, indus­trial-esque abstract sculptures, and for his inspiration by poetry and philoso­phy. The exhibition at the Tate focuses on Deacon’s interest in materials and their manipulation. On Monday, students were introduced to Celia Marin’s class titled City and Cinema. 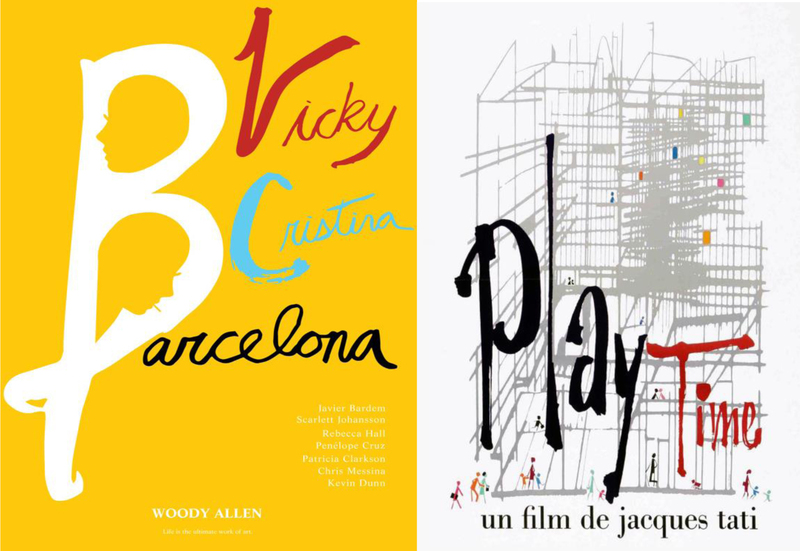 The class centered on por­trayals of Barcelona in film. Students were able to note similarities between the Barcelona of then and now, while noting the distinct identity that the city had in the past. In the first lecture of the second block of Design Communication / Building Technology seminar, the professor Pia Wortham, gave the students an in depth look into the history of the most prominent building technologies in the world and how they have evolved to create the buildings and structures we have today. The students also discussed how construction history applies to their own studio project. During the Phase I review of the Project for LaEscocesa redevelopment in the Poblenou neighborhood the students ofered new approaches to the reinvention of the area. Scenario 1 focused on developing an “Axis of the Arts” between the Rambla del Poblenou and the Rambla de Prim to connect two pedestrian areas and create a corridor along which many interventions and developments could occur. Additionally they have proposed new programs for La Escocesa which focus around culinary and visual arts with the intention of providing greater community access to the arts and an opportunity for the residents in the area to live in a more lively cultural environment. 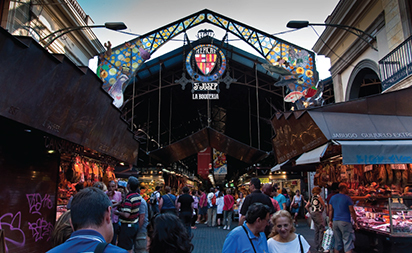 The tour of Madrid began with a visit to this historical market near Plaza Mayor. The market represents a historic cultural destination for the residents of Madrid that had become run down and unused in recent years. 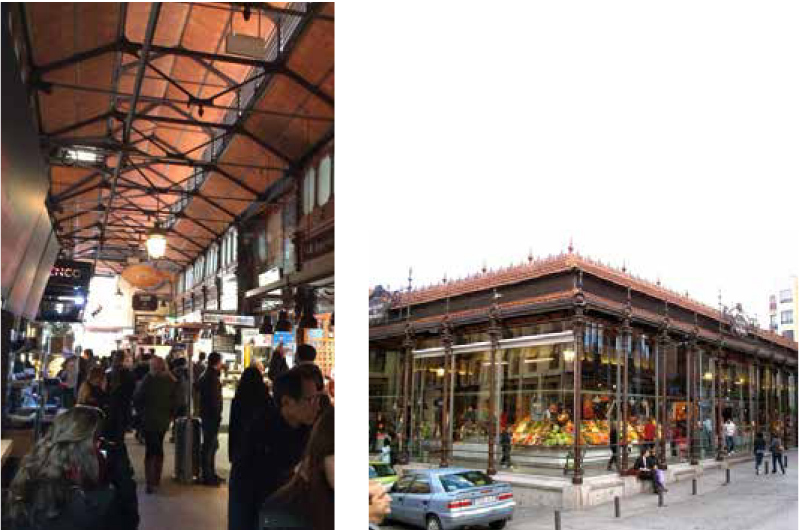 The refurbished market now represents a rebirth of the traditional market cultural and a place to show oἀ the food and culture of the city. The initial structure was preserved and although the food stands have a new contemporary feel, the experience of being in the market gives great exposure to local residents and an understanding of the lifestyle of those who live in the city. The previous headquarters of a large Spanish phone company has been transformed into a cultural center in Madrid. The Fundación Telefónica is now a cultural center and the home of exhibits of science and the arts. The exhibition on Nikola Tesla oἀers an opportunity to observe the career and mind of one of the greatest scientists of the 20th century whose work has contributed immensely to the lifestyle that is so “normal” today. 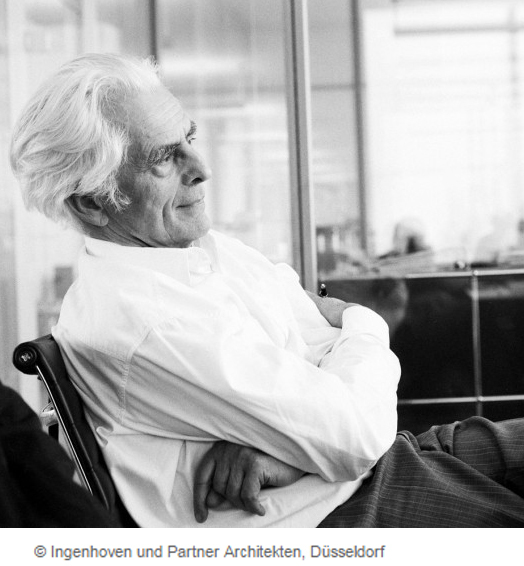 Additionally the exhibit that features Ferran Adriá and the study of the creative process behind his culinary career offers an opportunity for the public to see inside the mind of one of the most innovative creative thinkers of the culinary industry. Many may take for granted the science and imagination necessary to invent such unique dining experiences, however the food becomes even more beautiful when the process if understood. 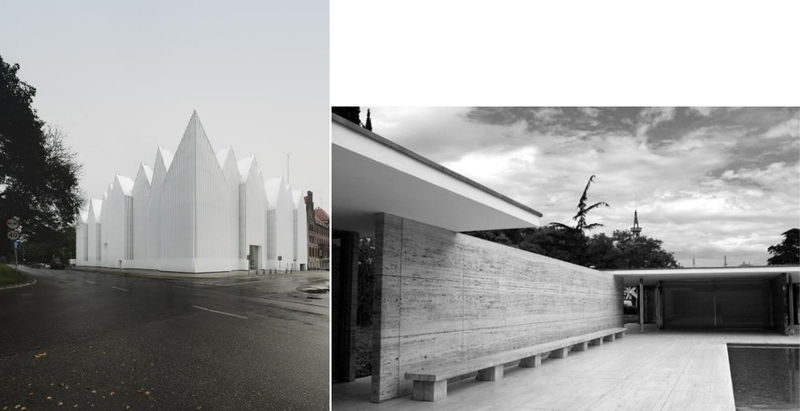 This is not unlike architecture in that the creative process is far more extensive than what a passer by may experience, but with the context in plain view, the work is even more impressive. 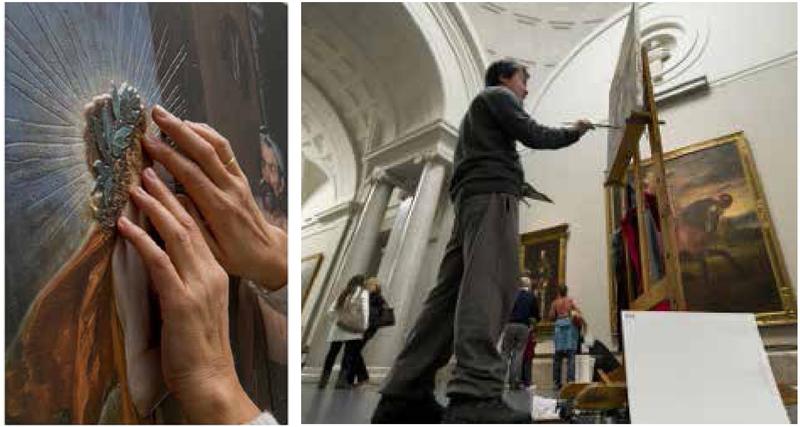 The classical art museum in Madrid, the Museum del Prado is currently offering an exhibit aimed towards sharing the visual arts of its collection with those who are visually impaired. The exhibition has taken six works from diἀerent eras and is allowing them to be touched in the hopes that those who cannot see the works may be able to gain a mental recreation of the work and hopefully gain an emotional connection to the work. The exhibit is not intended solely for the visually impaired but features 3D imagery, text in braille, audio-guides, and even opaque glasses for the non-impaired to gain a similar experience. While in Madrid, we visited the Royal Palace of Spain and one of the greatest examples of Spanish Baroque architecture. We experienced the overwhelming and intricate decoration of the interior and were able to look into the past lives of the Spanish Royalty. 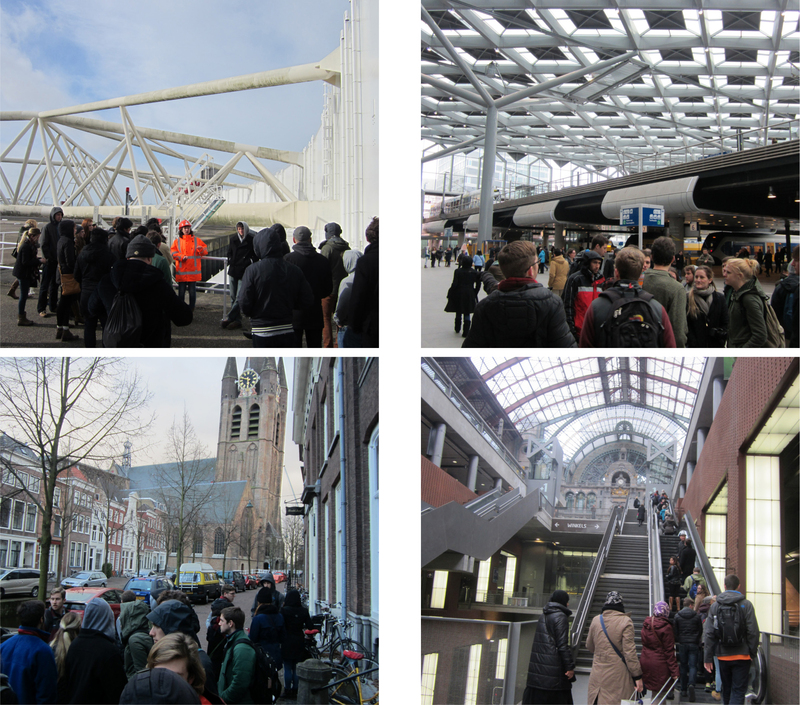 The students visited an example of a renovation project much related to their studio work. For the Media Lab Prado, the building was a former wood factory that had been transformed into a digital and project production space with an additional structural that reflects the modern age through its use of color and material. 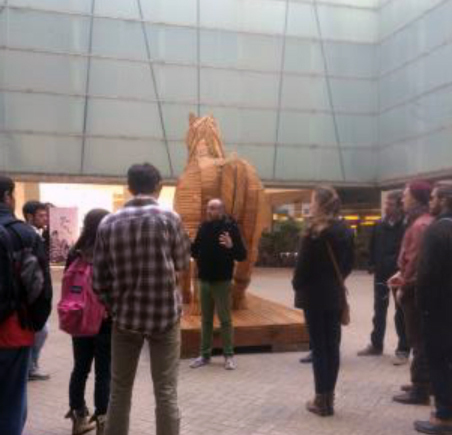 For the first part of this museum tour, the students visited the terrace of Reina Soÿa. This space allowed the students to see out over the city and observe the new, modern addition attached to the old museum structure. The second part of the tour included a viewing of Pablo Picasso’s La Guernica. Since it was the last day in Madrid for the students, they were treated to a trip to the famous Madrid flea market. Some items in which the students purchased included tapestries, scarves, shoes, socks, pastries and more. The flea market has been around for approximately 60 years and is still thriving! The center of the catholic church in Spain, the cathedral in Toledo did not disappoint. 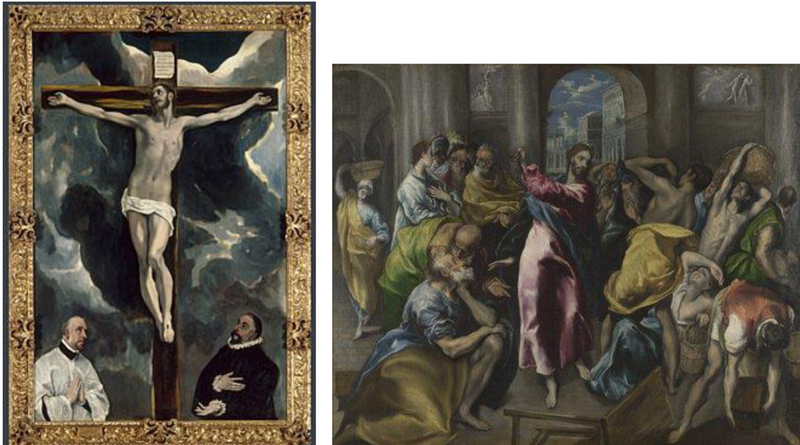 A masterpiece of the Spanish Baroque, it reflected the his­torical diversity of the Spanish people by incorporating architectural elements such as the geometric designs of the muslims, traditional gothic elements, and scenes depicting the patron saints of Spain and Toledo. While in Toledo we were able to meet Mariano Vallejo and learn about what he and his firm do in Toledo and else­where. We toured one of their earlier projects, the six patio-houses, which brought to mind the objective of our studio project at the BAC. Their proj­ect centered on creating improved housing on a pecular site, and making the building new and interesting while preserving the historical integrity of the surrounding area. CaixaForum Barcelona now hosts the traveling exhibition showcasing the creative processes that have made some of the most successful animated features in the past 25 years. Though the product of animation may be digital, the idea for a film often begins with paper and pencil. Visit the exhibition to view process works, conceptual designs, and process models of familiar figures and characters from the Pixar archives. It may inspire yourself to create an idea of your own. On Thursday, January 29th at 8pm, and every day until February 22nd, there will be a group exhibition showing the fifteen selected finalists of the Artevistas award for New Talent from different art disciplines, including many forms of art, one example by Jorge Alonso (finalist) shown above. Beginning in 1907 and continuing throughout his life, Corbusier collected postcards of as he traveled through the world. CentroCentro’s exhibition of 168 of the nearly 2000 of these postcards will soon come to a close. Through the exhibition, one may wonder the value of inspiration in the most minute of forms to an architect such as Corbusier whose ideas shaped the horizons of countless cities. 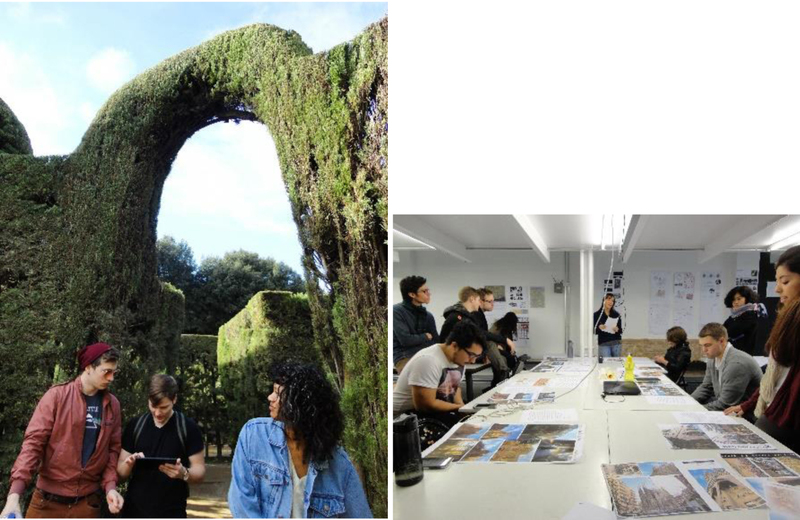 On assignment for our Design Philosophy class, students visited the Parc del Laberint d’Horta in the Horta-Guinardó district at the base of the mountains that meet the city of Barcelona. The gardens were once part of a private 18th century parcel of land that was donated to the city in the 1970s. Professor Pamela Duran asked students in their analysis of their experience to imagine describing the site to a blind person. Students referenced the different sounds, textures, and paths of circulation that occur in the garden due to the historical landscaping program that incorporated labyrinthine shrubs, sculptural ornaments, and water features. On January 27th, in History of Urbanism, students learned about precedents such as Park Güell (right), Placa de Espanya (left), and Casa Bloc. This covered from the early 1900s to the 1930s of Barcelona urbanism. On January 28th, students learned about the later 1900s. This included the industry crisis in Spain in the 1950s all the way up to the revitalization of the city with the Olympics in 1992. Pictured to the left is the Olympic Park and the Olympic Stadium is on the right; both of which we have visited as a class. 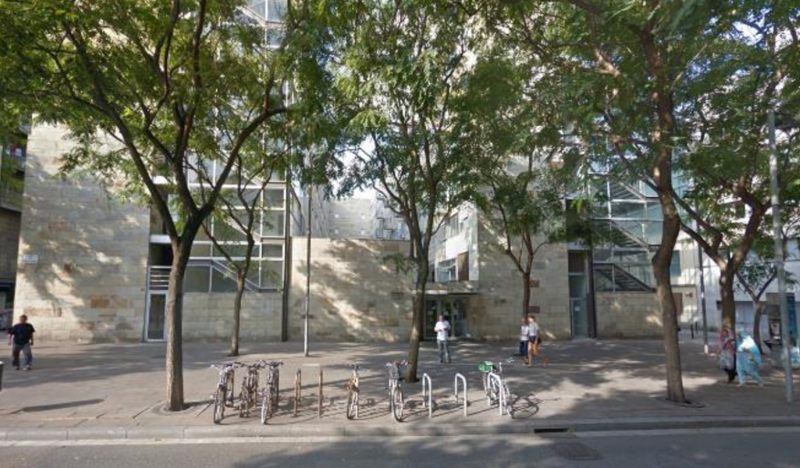 As part of our analysis of Barcelona buildings familiar to the students, we discussed with Professor Anna Ramos the merits of the street level space that their residential hall adjoins. Students commented on how the area, though generous, does not seem to be used too often, at least by the student residents. It was noted that due to the cooler season, there may be fewer people and less activity in the space than usual. Students compared this to the public relationship of the Col·legi d’Arquitectes de Catalunya building and library in Plaça Nova, noting that these buildings must share space with important landmarks as the city Catedral and the relics of the Roman walls, requiring the space to be accommodate greater pedestrian traffic and to not impose architecturally with those features. 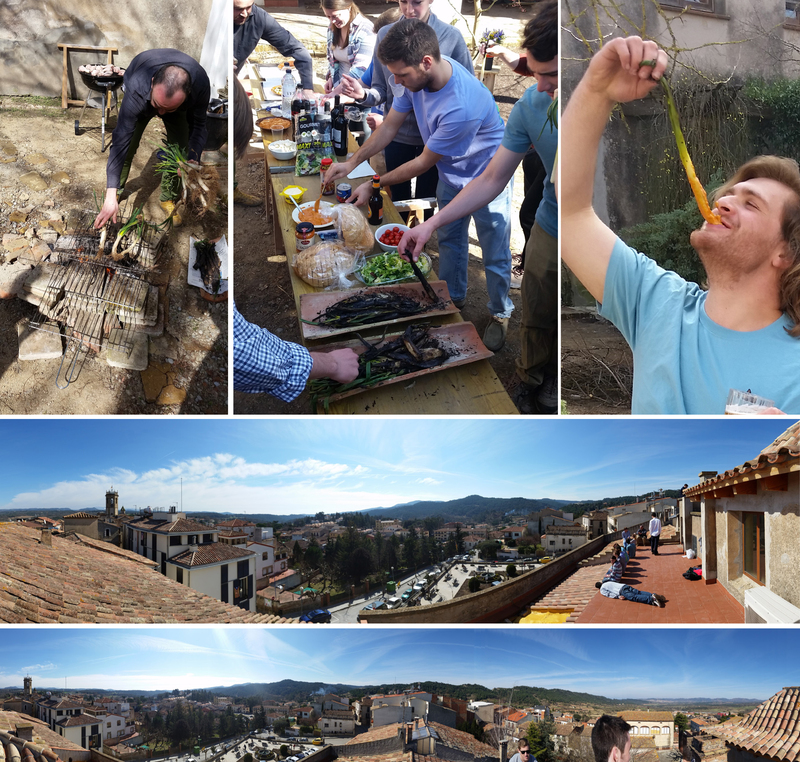 Work continues on the studio project on the La Escocesa site for group 2, led by Professor Marta Orte Garcia. Using the information collected from their site analyses, the students get together to put brainstorm a master plan for integrating the buildings of La Escocesa and C’Alier into their vision of the protofactory. Scenario 1meets as a whole to decide on master plan elements and starts to make conception decisions regarding the plan for the entire site and surrounding street. We combine multiple site analyses from different pairs to start to blend influence of different site elements into fewer diagrams.